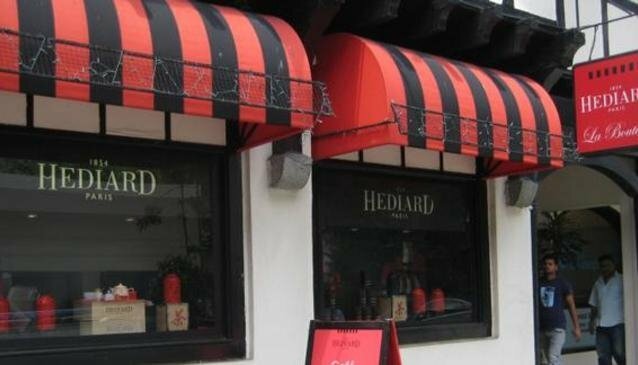 Hediard is situated in a row of shophouses a stone throw's away from Tanglin mall. With its interior decked in bold reds and blacks, the colors work perfectly to create a cosy environment, while peeping through a large full length window at the busy shoppers passing by. Although the French Cafe is mainly renown for its gourmet hampers and stylish tea menu, it's from breakfast to dinner that you'll gratify your palate. French style breakfast with viennoiseries, madeleine, toasts, home made jam served with coffee, tea or authentic chocolate or all day dining delights? The choice is yours. Relish in one of the well-garnished salads or try the house's famous tartine, which is Hediard' version of the Croque Monsieur.